Vicki Myron was a single mother who had survived the loss of her family farm and an alcoholic husband. But her biggest challenge as the new head librarian in Spencer, Iowa, was to raise the spirits of a small, out-of-the-way town mired deep in the farm crisis of the 1980s. Then, on the coldest morning of the year, Vicki found a tiny, bedraggled kitten almost frozen to death in the night drop box, and her life—and the town of Spencer—was never the same. Dewey, as the townspeople named the kitten, grew into a strutting, affable library cat whose antics kept patrons in stitches, and whose sixth sense about those in need created hundreds of deep and loving friendships. As his fame grew, people drove hundreds of miles to meet Dewey, and he even ended up in a hit television documentary…in Japan! Through it all, Dewey remained a loyal companion, a beacon of hope not just for Vicki Myron, but for the entire town of Spencer as it slowly, steadily pulled itself up from the worst financial crisis in its long history. This is a book I've heard heaps about, and as I love animal books, I snapped it up when I found it in a used bookstore here in Kathmandu some time ago. However. I just was never able to get into it. I found the author's voice annoying rather than endearing--instead of just telling the cat's story, to me she seemed to repeatedly emphasize how she was more special to the cat than the other library's employees were. I like the idea of the book, but in the end didn't even finish it. So perhaps it got better. And I know that many others loved it, so I'm glad now to set it travelling to another reader for whom it will hopefully be just what they need. As with all books registered by me, you are welcome to do as you please with it now--keep it forever if you love it, or pass it on if you choose to. It's yours now! Thank you! Looks like a great read. Going to the winner of the Export an Animal Sweeps. I think she is a cat lover and will enjoy this. Yes, I'm a cat lover, and I just have to smile when I see the adorable cat on the cover! 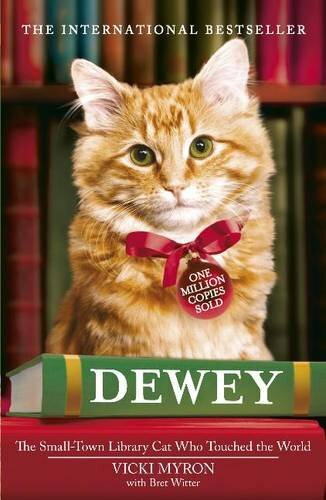 I'm considering rereading this book, but if not I'l for sure pass it on to another cat lover! Sending this to the winner of the Export an Animal Sweepstake . I was the lucky winner of this round of the "Export an Animal" sweeps. Looking forward to reading it! Thanks so much!